Thread: Auricoste MN: original configuration? Jon sent me this French strap to put on my Auricoste. So it will be back to the original configuration like back those days when it was issued. I'm not sure every 'plongeur' used this kind of strap. I've seen pics of Auris with Speedy-like velcros and perlon/nylon straps. It like my wife says: "How to recognise a watch nut: he wears an expensive watch on a cheap strap." Anyway, I promised Jon a pic of the watch on the French strap. (And it gave me an excuse to put an old camera back in use). As far as I know, these straps were not issued but were made (or ordered) by the divers themselves. The elastic webbing comes from the quick release straps of a parachute harness which keep the buckle under tension, thus when it is struck it will spring open. Not inadvertently, one hopes! That's the story I heard too. The elastic on the parachute needed to be replaced each time it was used, so there was quite a lot of spare material floating around! Menno's sure looks a lot better on that MN Auri than mine does on my cheapie knock-offs! Gentlemen, I'm learning every time I log on! Steep learning curve here! BTW, did you notice the odd shape of the case on the side where the crown sits? This is not symmetrical! When one wears the watch, the bezel covers this phenomenon when you look at the watch. Due to the position of the camera and the watch, it's clear to see that it's not symmetrical at all! Take a look at Bill Yao's MkII Seafighter for a modern version of this case shape. Here is a pic of a Auricoste MN with the origial perlon strap. Pic taken from a museum in France. Last edited by EZMone; 21-02-2010 at 02:53. Also Squale diver's diver's watches used the same case design I would rather spend the money on vintage than on a homage for about the same price and the vintage one will hold it value and may be go up in price. Thanks for posting the photo, Menno. Although he seems modest, Simon is the expert on these. On MWR he posted a great link to a French site http://forumamontres.forumactif.com/...135.htm#942121. (No problems about posting links or duplication here - the only reason I haven't posted the MWR link is because you now have to be signed in to MWR to view the threads, so if I post a link, I'm not sure if that would then give everyone access via my membership? Equally, by the same token anyone who is not a member over there would probably not be able to view it. The aim of this forum is simply to provide a friendly place for the discussion of all military watches, irrespective of their cost - £15 Vostoks are as welcome as £50k milsubs. We are not trying to compete with anyone else. The aim here is to create a comprehensive, high quality resource of information and if posting external links compliments your post, then please do so. This is why I also use the name of the watch as the thread title, as it makes it easy to pinpoint the information. So far we have never had to moderate a post. We've had photos of underwater combat diver's guns and knives etc. The only thing we would ask is that if someone posts photos of their pride and joy and it turns out that you know it's a franken or has "issues", then please try to be diplomatic - I've seen self-appointed experts be extremely critical of Russian military watches on other forums when in fact the watches in question were entirely "correct" and documented, it was just that the detractors' knowledge was defective! Military watches by their very nature often break the rules - look at that KM Hanhart that Dan posted recently for example. If they have a hard service life they will be broken and that service life might exceed the availability of spares, hence the quartermaster might use a similar part which happens to fit in order to keep the watch serviceable. Equally, in the services, like any other piece of equipment, broken watches are canniblised to keep others working. Please keep the posts coming - the quality is truly outstanding. If we carry on like this, I think a book is on the horizon...). Back to the strap, whilst researching decom' papers I reminded myself that there were three main types of MN divers - ship's; clearance and combat. Logically, bearing in mind that these straps are made from parachute elastic and only the combat divers use parachutes, only watches used by combat divers would have used these "home-brewed" straps - after all, they are called "Nageurs de combat" straps. However, there are also training bases where presumably instructors would mix and be sent on refresher courses etc so in practice, I would guess that inevitably ship's and clearance divers might have ended up wearing these combat straps too? Add to this the fact that towards the end of their service life these Auricostes outnumbered all other makes of watch by two to one and those odds increase. 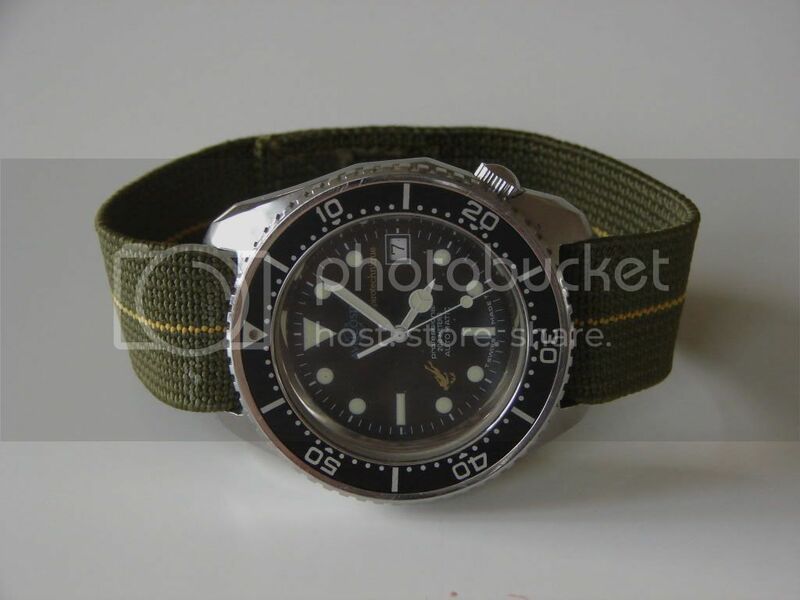 So if your decom' papers show your watch was worn by combat divers, then it certainly could have been worn on this type of strap. Otherwise, it's still possible. (If you have combat decom' papers please send me a pm as the only ones I have seen were for a depth gauge). P.S. On the subject of parachute elastic straps, an ex-RAF WW2 pilot friend of mine has one of the elastic straps from the parachute of Rudolph Hess. My friend was scrambled in his Spitfire to intercept a lone Me 110, which turned out to be carrying Hess who was supposedly flying to England to try to negotiate a truce. The NCO who recovered the parachute presented the elastic strap to my friend, who still has it to this day. Last edited by StampeSV4; 21-02-2010 at 13:58.